This weekend I racked my beer to secondary and took a fix - determined where my current brew stands on it's path of intended movement (PIM) from wort to porter. I drew a sample and once the remainder of the beer was racked and stowed I took a gravity measurement and tasted a couple of mouthfulls for good measure. 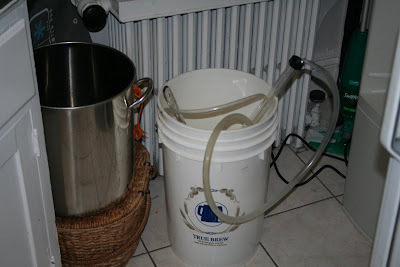 The "beer" when I opened the primary was as it should have been - clean and clear, and it smelled great. The transfer went smoothly, with very little sediment taken up. The slurry of yeast at the bottom of the fermenter was impressive. Some day, I'm going to think and prepare ahead enough to recover and re-use the stuff. 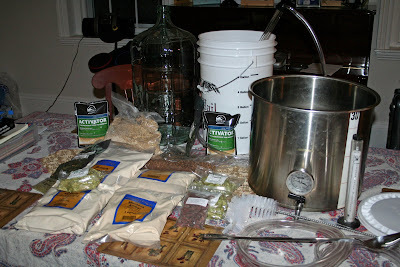 SG was 1.018 (OG 1.050) so it currently stands at about 4.4% ABV. It tasted immature but pretty much like a porter. Strong coffee-like notes, the roasted barley was evident, medium bitterness. So I have no doubt some more time in the carboy and then the bottle will have this beer tasting as it should. "Ideally" the FG should be 1.016 or below and I'm pretty sure those last few thousandths will drop off in the next week or so. If not, no biggie, I can figure it out next time. It's like dead reckoning. Estimate your future position based upon your last known position and course and speed, and then your fix tells you where you really are. Right now, it looks like I'm pretty much "on PIM". On a ship, anything not properly stowed or secured is "gear adrift". In good times, it makes sailors unhappy. Compartments fail inspections, the gear gets confiscated, and the seamen who cleaned the compartment are unhappy because they have to clean the compartment again and present it after working hours. In bad times, it gets people hurt. Heavy weather and rolls cause it to fall on people, cutting them, bruising them, or - if it's large - breaking bones or worse. In the worst of times, it gets people killed. The Chesapeake lay off the coast of Norfolk, Virginia, and was under the command of Commodore James Barron. The Leopard, under the command of Salisbury Pryce Humphreys, hailed and requested to search the Chesapeake for suspected deserters from the British Navy; when the Chesapeake refused, the Leopard began to fire broadsides, killing three aboard the Chesapeake and injuring another 18 including Barron. The Chesapeake, her decks cluttered with stores in preparation for a long cruise, managed to fire only a single gun in reply to the Leopard, and Barron quickly struck his colors and surrendered his ship; however, Humphreys refused the surrender, and simply sent a boarding party to search for the deserters. Of course, American seamen were being impressed by the Royal Navy, but America was not at war - the gear could always be stowed once at sea, since there's no way they could be attacked. Chesapeake could afford to start her cruise in a low state of readiness; what could possibly happen? A bad chapter in the unfortunate life of an unfortunate ship. 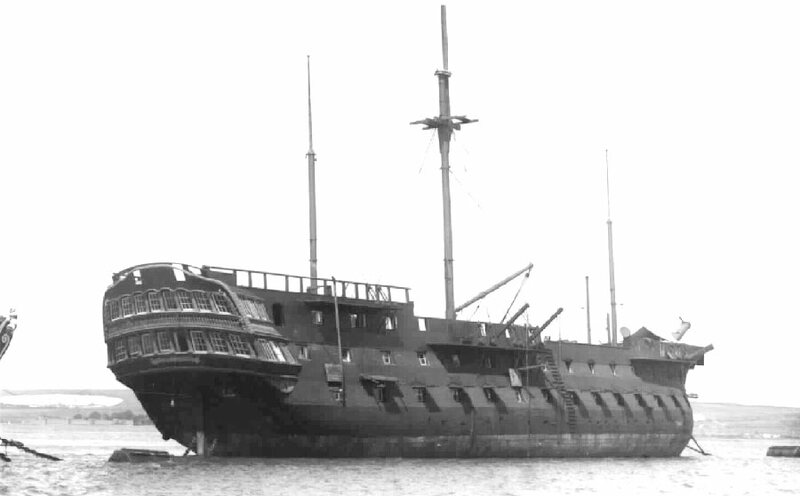 She was eventually captured by the British off Boston on June 1st, 1813 and brought back to England as a prize. While not technically a "Man O'War", Chesapeake was still a frigate - a fighting ship built to fight and manned by those who would otherwise be "Man O'War's men". And no proper Man O'War's man should countenance gear adrift. This won't cause me to eventually be taken and broken up and made into a mill. 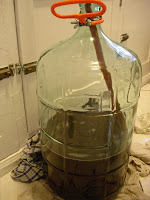 In fact, it makes me, the captain of this Man O'War, MORE ready to brew at a moment's notice. It WILL, however, get me in trouble with The Admiral. So I'd better stow it. The rigging; clew, bunt, leech, reef, halyard, braces, tacks, sheets, lifts, stays, shrouds...the standing and running lines that bring function to the towering form of the ship's mast. The interaction of muscle, line, wood and canvas can be mastered in time (it is actually not as difficult as it looks) and the judgment to govern them is not impossible to acquire, though it does come easier to some than others. Here is this man o'war's new "rig". The kettle is old, but the majority of the rest of the material is new. I went through my Christmas money and then some getting it, but it was worth it. It's dangerous walking into a homebrew shop, especially one where the owner keeps kegs of what he's most recently brewed by the register. I could've spent hours there. 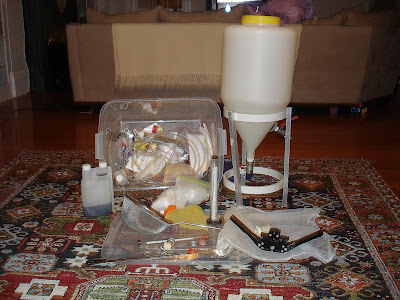 With this rig, I plan to make some serious beer. But before either serious sailing or serious beer can happen, one must literally "learn the ropes". In the case of our Coast Guard friends here that means sweating lines and getting the basics of line handling down before moving on to the finer points of the art of sailing. 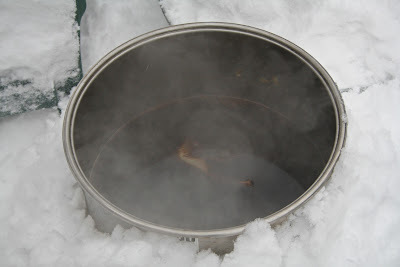 For me today, it meant going back to basics; re-learning the ropes in a very real way and getting familiar again with the mechanics of boiling, chilling and transferring. 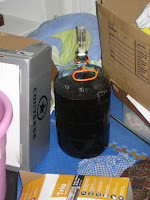 Though when I last brewed I had got as far as partial-mashing, I decided I would brew one of the simplest ways; malt extract with specialty grains. I'll start by saying I am not a fan of porter. I see a black (or very dark) beer and I want to taste a stout. But I'm making this for a reason - my father's 65th birthday next month. He loves porter, and in 2004 he and I made a similar recipe (this one is based on it) for him to have all to himself, and he loved it. He still talks about it. So I guess it was good. 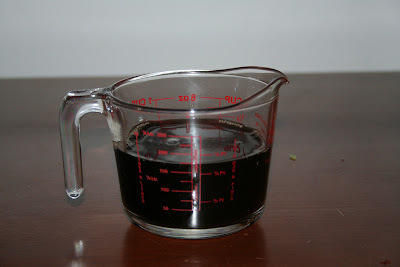 Also, porter is one of the most ubiquitous - a staple, if you will - styles around, so it's good to be able to brew one. And who knows, I may brew one I actually like some day. *Roasted barley is really not part of the traditional porter style, but it seems porter brewers use it anyway. I decided to include some (approx. 3% of the total grain bill) as it contributes to a brown head, and also to get some roasty character with the chocolate. It also might help me like the porter - remember, I like stout. **The yeast was a deviation from my original desire, the Wyeast London Ale. But when the supply store is out, you have to find a substitute. The fermentation characteristics are similar, though I'll get a slightly more attenuated (drier) beer than planned. The cocoa beans are also something new that I didn't do last time. I'm a fan of Sam Adams Chocolate Bock, which has rare cocoa nibs added to the secondary; I plan on doing the same (though not in the same quantity). 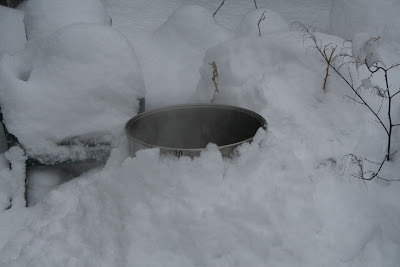 Snow banks are a good way to chill wort without wasting water. I don't know why this reminds me of the beginning of The War of the Worlds. No Martians here, just sweet, hopped wort. I like this color. I hope it keeps it. Through the maltiness of the wort (and the loss of taste due to my cold) there was a definite, but not too strong, roasted flavor, along with the coffee-like character of the chocolate malt. The entire concoction is happily percolating away as I type. 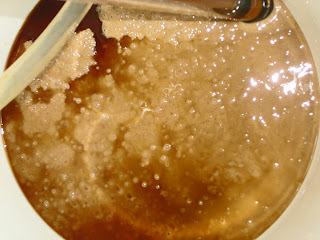 Less than seven hours after pitching the yeast the fermentation lock was slowly bubbling. Fewer than 12 hours later I had to replace the lock with blow-off tubing. Vigorous fermentation is a great sign. Like I said - maybe this will be a porter I could come to like. Welcome to Man O' War Brewery, celebrating and recognizing these two great hallmarks of civilization - beer and the sea! Dedicated to all who have sailed, lived, fought and died on the sea and ships, and to the wonderful drink that nourished them in the early days of sail, and still brings them enjoyment today. When a Man O' War was too old for service, or a nation's navy was not in need of it's services, the ship was stripped down to a condition that required the absolute minimum amount of maintenance to keep it afloat until it was either broken up or re-activated. Such ships were said to be "in ordinary". Here you see HMS Implacable, 74 - originally the French Duguay-Trouin. Survivor of the Battle of Trafalgar, Duguay-Trouin was captured not two weeks later by the British and placed into service in the Royal Navy, with a new name, until she was scheduled for disposal in 1908. She languished in ordinary until 1949 and, despite efforts to raise money and save her, was scuttled. Now, only HMS Victory - 102 remains to remind us of that great sea battle. To me, the ship in ordinary is a sad sight, a mere hulk devoid of life. If Implacable could have prayed, I'm sure she would have. Prayed for years for restoration, for rebirth, to once again have sailors walk her decks, swing in hammocks and bare-chested work her "Two-and-thirties" in heated action. To feel their knees and the holystones at their hands as they cleaned the spar deck, to feel them as they scramble up the shrouds and out on the yards to set, reef and furl canvas, to feel the pace of the captain and officers on the quarterdeck. To hear the violin's music and the sailors' songs. How she must have wondered why, when she finally got underway on that cold December day in 1949, she was feeling none of these things. The scuttling of Implacable was a sad day for many in England who recognized the significance of the ship, the battle, and the importance of ships and the sea to humanity in general. "Implacable - Never Again" became a rallying cry for the World Ship Trust. Here is another "ship in ordinary". My brewing equipment - left in storage, idle, growing dusty, the tubing useless and dry, waiting for a willing hand to employ it once again in a ritual nearly as old as civilization itself - the conversion of grain, with aided by water, yeast and flora, to the potion that has provided mankind with nourishment, with relaxation, indeed with a great deal of culture throughout the centuries. Like the sea and ships, beer and brewing are truly a mark of civilization. Soon, when I have re-rigged and provisioned my ship, I will take in all lines and set out to re-learn the craft I reveled in as a young man. I look forward to sharing my experiences, hearing from other brewers and those interested in the sea and ships, especially the fighting ships of years long gone and the sailors who sailed them.